Q 1: It’s your time to fly out of the nest! What is next for you? Carrie Bohn: I’ll be moving to Jackson Mississippi to be an education fellow at the Institute of Southern Jewish Life! Lillian Kaufman: I will be going to Israel for 15 days. After that I don't know what I will be doing but I am looking forward to whatever opportunity comes my way. JC (Josh Shapiro): Hopefully, I am able to find a job in my field. I do not know a lot about the field that I am going into so I want to use this time to learn and get my feet wet. Once I have saved enough, I would like to move somewhere else and possibly attend a graduate school. 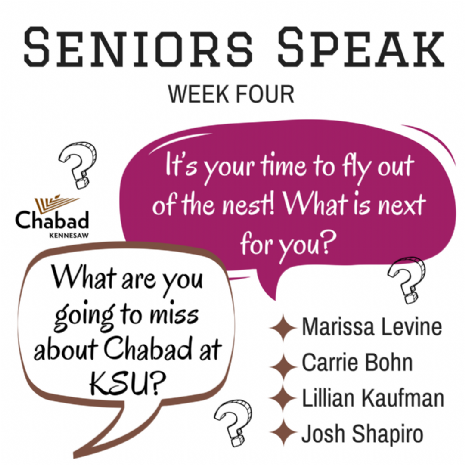 Q 2: What are you going to miss about Chabad at KSU? Marissa Levine: The sense of community that Chabad gives is something that I am definitely going to miss. But I know that the Rabbi and Nechami will always be there for me whenever I need them. 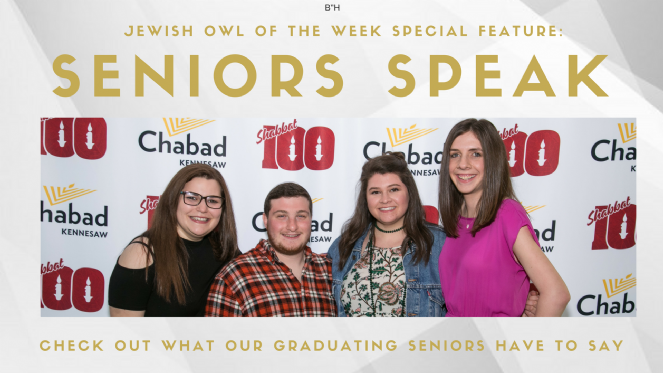 Carrie Bohn: I’m going to miss all of the events during the week that Chabad hosted, such as the trivia nights, Sinai Scholars, and girls events. They really made my time at KSU great! JC (Josh Shapiro): There are many things that I will miss about Chabad. The first thing is definitely the rabbi. He is always there for you no matter what and knows just what to say to get you under control. The second thing I will miss is the people. The people at Chabad are some of the best people that I have ever met. They welcomed me with opened arms. The third thing I will miss will be all the food. Q 1: Tell us your favorite study spot and your favorite hangout spot on campus? Also, where is your favorite spot off campus? Marissa Levine: When I’m studying on campus I’m either on the 4 th floor of the Burruss Building or in the library. Off campus, my favorite place to be is Orange Theory Fitness. I have been going there to work out for over two years now and it has been a place for me to go and forget any stresses that I may be going through. Carrie Bohn: My favorite study spot is definitely the third floor of Prillman. My favorite hangout spot is the green of course. When the weather is nice I love to get my hammock and l hangout (literally) with my friends. Off campus I love to have all my pals over to watch some of our current Netflix shows. Or the mall cause shopping. Lillian Kaufman: My favorite study spot on campus is the third floor of the library. I love to hang out at either the commons or the first floor of the business building. My favorite spot off campus to hang out is either my friends apartments or the Chabad house. JC (Josh Shapiro): My favorite study spot is very specific. It’s in the third floor of the library, in one of the cubicles that are at the end of the aisles or next to the windows. My favorite spot to hang out on campus would either be the commons or on the green if it’s a nice day. My favorite off campus hangout spot would be at any of my brother’s apartments. Whenever I go I am always welcomed and I always know a good time will happen. 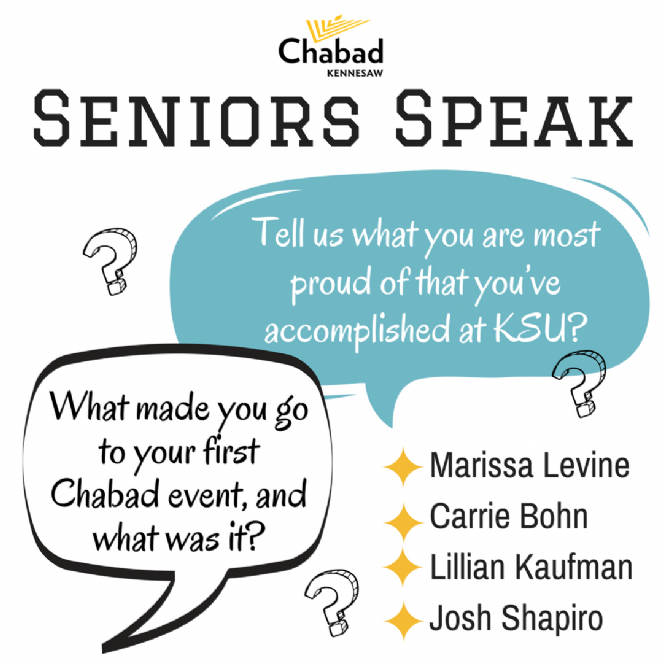 Q 2: What does Chabad here at KSU mean to you personally? Marissa Levine: To me Chabad is home away from home. Since the moment I met Rabbi and Nechami they have been so nice and welcoming. Chabad has been my comfort zone for the last 4 years. It doesn’t matter what I’m going through, celebrations or struggles, Chabad has been there for me to support me just like family. 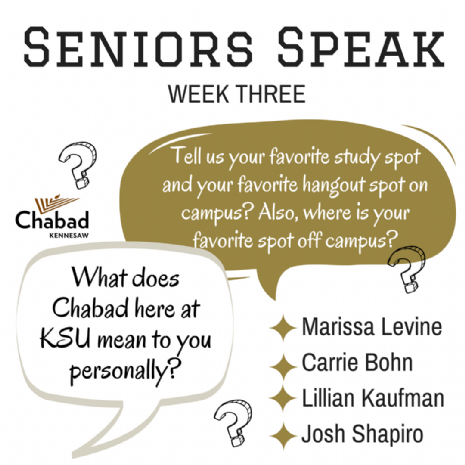 Carrie Bohn: Chabad at KSU to me means family. Rabbi and Nechami will always have a special place in my heart, and my friends that I’ve made through Chabad are truly amazing. Lillian Kaufman: Chabad at KSU means family. I watched it go from having at most 10 people at a typical Shabbat dinner to having an average of 30 people at each Shabbat dinner. Now we are able to even have a Shabbat 100. I remember when this was a dream to have this many students at KSU attend Shabbat dinner and now it is a reality. I cannot wait to come back after I graduate and see the growth in the Jewish community at KSU. JC (Josh Shapiro): Chabad to me from the beginning started out as a way for me to get free food but it has changed since then. Now, it is a big part of my life. It is a place where I have met a bunch of my friends and I know there will always be a good time. At Chabad, I am able to be the person that I want to be and it has given me the confidence to be the best version of myself. Chabad has has seen me at my best and at my worst and I will never change that. Q 1: What would you do differently if you could do it all over again? Marissa Levine: I don’t think I would do anything differently. Everything I’ve done so far has gotten me to this point and I’m very proud of where I am. Lillian Kaufman: The one thing I would do differently if I could do it all over again is join a learning community my freshman year. I feel this would have made getting adjusted to college and making friends easier. JC (Josh Shapiro): If I could go back and do it all differently, I wouldn’t change that many things. The first thing would be that I would’ve gone to Shabbat dinners sooner than I did and I would have studied a lot more my freshman year to get better grades. 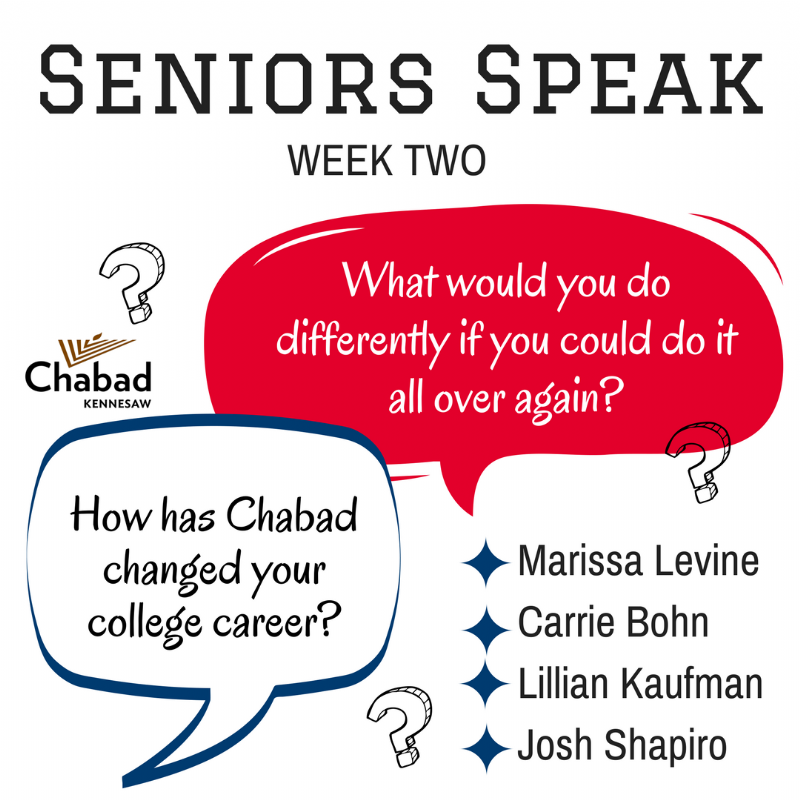 Q 2: How has Chabad changed your college career? Marissa Levine: I can’t imagine my college career without Chabad. All of my closest friends in collegeare the people I’ve met through Chabad. I am so thankful and all of the experiences I have been able to have because of Chabad. Carrie Bohn: Chabad has given me some of my favorite memories in college, and also has provided me with some amazing opportunities! Lillian Kaufman: Chabad has changed my college career in so many ways. It was the place where I met one of my best friends but also the place where I really connected Judaism. I truly fell in love with my religion like never before. This was all thanks to the many programs Chabad offers such as helping cook Shabbat dinners on Thursday nights, challah bakes, weekly Shabbat dinners, Sinai Scholars, annual Shabbaton, a trip to Jewish sites in Poland (Living Links), and birthright with Mayanot. Chabad became my go to place especially on Friday nights for a killer Shabbat dinner. It also became my home away from home and my second family. I always joke that Nechami and Rabbi are my Kennesaw parents. I could not image my college career without Chabad. JC (Josh Shapiro): Chabad has done a lot of good for me in my college career. Because of it, I always have something to do on Fridays for starters. Also, I have made a lot of life long friends who have become my family. Lastly, Rabbi has been my rock in college; he is somebody that I can always go to that can help me with anything at anytime. Q 1: Tell us what you are most proud of that you’ve accomplished at KSU? Marissa Levine: My two years as President of Chabad was one of the most rewarding things I did during college.  I was able to help establish the early stages of what Chabad at Kennesaw would eventually become. I’ve loved being a part of the growth of Chabad here and can’t wait to see how it evolves in the future. Carrie Bohn: Graduating with honors! Lillian Kaufman: I am most proud that I will be gradating KSU with honors. JC (Josh Shapiro): There have been many things that I have accomplished at KSU, but the thing that stands out is the fact that I helped start a Jewish fraternity. The fraternity has had a direct correlation to growth of the Jewish community! When I come back in later years and Shabbat dinner at the Rabbis averages out to be 100 people, I will know that I was one of the people who got us there. Q 2: What made you go to your first Chabad event, and what was it? Marissa Levine: I was lucky to have my cousin, who some of you reading may know, Matthew Prater, already involved in Chabad who pushed me to come to my first Shabbat dinner. Carrie Bohn: I had heard about Chabad from a friend, and I knew it would be a great way for me to meet other students and have a connection to Jewish life on campus. The first event I went to was the welcome BBQ in 2015 and it is where I found my Jewish place at KSU. Lillian Kaufman: My first Chabad event was the Welcome BBQ my freshmen year. I was told about this BBQ from the first Chabad President, Josh Seiden, and he told me it was going to be a lot of fun. He also told me that Nechami and Rabbi were very welcoming and that I’d love them. Which is 100% true. I also knew I wanted to get involved in Jewish life and this was my chance. JC (Josh Shapiro): The first Chabad event that I ever went to was a Shabbat dinner. In the early years of AEΠ, we needed to have a Jewish event. Our leadership met with the Rabbi and a week later we were at his house for dinner. I have been going ever since.